Sometimes life is full of surprises. This story has more than one surprise. A few weeks ago I was looking for a cheap frame for future paintings that I wanted to paint. I usually go to Good Will and look for the largest frames I can find. On that particular day I saw a 24″x36″ frame turned away from me. 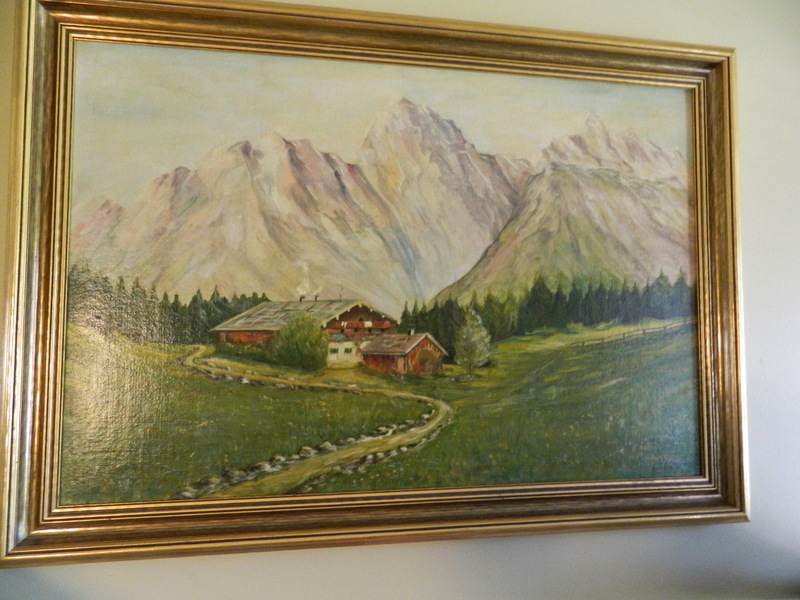 I turned it around and was shocked to see an original oil painting of an alp house tucked into the mountains. It was $15.00 so I bought it and on the way home stopped at my artist friend Emil’s house to see what he thought about it. He was impressed with it and told me how to clean it. I took it home and carefully cleaned it’s varnished surface and it just popped out with clarity and beauty. He later stopped by to see it clean and said it is worth about $700.00. The artist’s name was in the corner and the date, 1955, the artist, E. Schanhoff. I couldn’t find that name on the internet related to art in any way. I hung it on the wall and have been enjoying it very much. Today I decided to send a picture of it to my dear friend Ursula in Switzerland. Thinking it might be Swiss and also thinking I might just paint my goats into the picture. 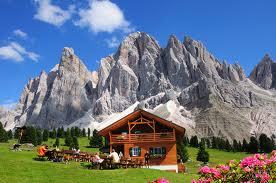 She wrote back immediately and said it is not Swiss but it is a scene from the Dolomite mountain range in Italy. Emil did say he thought the mountains looked like mountains in Italian paintings, however the name is not Italian. So, she said that it is from a place called South Tyrol. But the biggest surprise of all was that she sent a photo of an alp house tucked into the exact landscape with the same mountains in the background. This really made me more curious so I started reading about South Tyrol. It may be considered Italy but the Austrians who live there consider it Austrian. It was taken by Italy after the First World War and they are working on being independent from Italy preserving their German language and Austrian culture. This painting was probably done by someone who cared a lot about the setting and the history of South Tyrol. To learn more look up on Wikipedia Sudtirol or South Tyrol. There is a very good map and explanation of the situation. Ursula and I have been good friends for 33 years. Our lives have been linked in many ways. My mother was American born Swiss with a dual citizenship and spoke Swiss German in fact the same dialect as Ursula. Ursula and I share many customs and interests. We traveled to all the regions of Switzerland together with backpacks and I have been to her home twice. The painting becomes more dear to me as we discovered the link between me finding it and loving it and her great interest in this very mountain range. She had so hoped to visit it in October so was very amazed that I sent her a photo of the painting of the very place she wanted to be in the same month. The photo above is of an alp house in what appears to be a very similar spot. It makes the painting so valid to me with a history and a story and a connection. This is why I say it is a God thing. How could I find a painting in West Bend at Good Will that is so significant to Ursula and again give us a way to connect? How did this painting get to West Bend? It is even a wonder that I found out the history of the painting with a simple email and a little research. Now I am unsure about altering the painting at all. I like it so much more now. In my imagination I walk down the path or imagine calling in the goats to come to the barn for milking. They walk along the fence single file. Well, to tell the truth I have spent a month of my life living and working in South Tyrol in the city of Bolzano and passed weekends in those same mountains eating and drinking beer in homes very similar to the one in the painting. I can also attest to the fact that they have a tremendous amount of pride in their Austrian/German hertage. In fact one half of the city of Bolzano speaks only German and refuses to speak Italian. I found this fact quite surprising. I remember the Italians complaining about how proud they were, also it is worth noting that the German speaking half of the city is much wealthier. They have schools that speak only German, books stores with only German books etc… Many people in the city speak both Italian and German, but a surprising amount of people speak only one or the other. I can say that it is a gorgeous place that captured my imagination, and it is vastly different from the rest of Italy. It is very beautiful and well organized, I remember riding my bike to work on bike paths that wound through the city and parks. I remember that the city sat in a valley surounded by the Dolomites, and I remember on the outskirts of the city of the city were endless apple orchards. I don’t know why I had the thought but I remember eating in a restaurant on the edge of the orchards and thinking how wonderful it would be to put a bed in the orchard and sleep there. All in all it was a memorable month and the closest I have gotten to Swiss, German or Austrian culture. Now I feel a connection to the painting as well! Thank you for sharing this. How exciting and interesting!Chris Ostergard-Jewell262-490-1917chris@thomjewell.net OR clojewell@gmail.comPhilippians 4:13: I can do all things through Christ who strengthens me.